French President Emmanuel Macron (file photo). Following a meeting with Egypt's president Abdel-Fattah el-Sissi in Cairo on Monday, French President Emmanuel Macron sent a strong message in support for human rights and civil liberties. 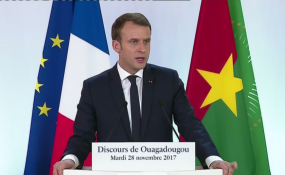 "Stability and durable peace go together with respect for individual dignity and the rule of law and the search for stability cannot be dissociated from the question of human rights," the French president said during a joint press conference. "Things haven't gone in the right direction since 2017. Bloggers, journalists are in prison and because of that Egypt's image can find itself suffering," Macron emphasized. El-Sissi has been in power since 2014, just a year after leading the overthrow of Egypt's first democratically elected and controversial president, Mohammed Morsi of the Muslim Brotherhood. A crackdown on Islamists and opposition figures followed el-Sissi's ascent to power, with hundreds of them detained and sent to jail. Responding to Macron's criticism, el-Sissi told reporters that when it came to citizen's rights, regional turbulence and the fight against terrorism should be taken into account. "Egypt does not advance through bloggers. It advances through the work, effort and perseverance of its sons," he said. Macron pushed back on the el-Sissi's claim, stressing that some of those detained by Egyptian authorities did not pose a real threat to the stability of their country. During the trip, French and Egyptian officials signed a series of economic and development deals, which included Paris' support for social policies and female entrepreneurship. A memorandum of understanding for the expansion of Cairo's metro was also signed. When asked if French weapons in Egypt were being used against civilians, Macron was dismissive. He said the weapons were only being used for military purposes. Macron also denied that his delegation had discussed new military contracts during the meeting with el-Sissi.